Don McAllister’s Super Secret Project is revealed as the ScreenCastsOnline Monthly Mag for iPad with Don’s videos and reviews and tutorials by notables such as me, an (unfavorable) review of SoundBunny from prosofteng.com, and a very positive review of MacTubes from macapps.sakura.ne.jp. Donald Burr gives us a tutorial on how to install the Youtube5 extension for Safari at dburr.clarify-it.com. How to use TunnelBear from tunnelbear.com to watch the Olympics on the BBC. In Chit Chat Across the Pond, Bart walks us through security considerations in Mountain Lion. Hi this is Allison Sheridan of the NosillaCast Mac Podcast, hosted at Podfeet.com, a technology geek podcast with an EVER so slight Macintosh bias. Today is Saturday August 4, 2012 and this is show number 378. I sure hope you eventually got show #377 last week. My normal process to publish the show is to have Steve test it before I announce it’s up. But now that Breaking Bad is in the new season on Sunday night, I waited till after the show to publish, finishing after Steve had gone to sleep. So without Quality Control Director Steve’s assistance, I didn’t fix it until I was alerted at 5am on Monday that I had not changed the date in the sequence on the file attachment. I had a lot of people tell me that it was borked, and I answered every email and tweet that I got – hope you didn’t get left out in the cold because it had an Awesome interview with Jason Howell from Tech News Today. Remember that next week I’ll be on vacation so I need some recordings from you – I’ve gotten a few already but I could use a few more. Email, DropBox, carrier pidgeon – whatever method you have at your disposal will be acceptable. Also remember that when I’m on vacation, NORMALLY Mrs. Kravitz watches the house, but this week MR. Kravitz is watching the house. He’s more attentive than Abner for sure, so I’m confident my house, and Buzzy are safe! This week we have news of Don McAllister’s super secret project, a review of the Mac application SoundBunny to change the volume of applications independent of each other, a review of MacTubes to allow easy search and download of YoutTube videos, and a review of how to use TunnelBear to watch the Olympics you want to watch. In Chit Chat Across the Pond Bart’s back again this week with a discussion of security in Mountain Lion. I wanted to take a minute to thank everyone who’s been using the Amazon affiliate link on podfeet.com. I’m not sure if it’s the embedded links inside the blog posts for products I’m talking about, or if you’re using the search box on the right sidebar, but either way you’re helping out the show a lot. It really makes a difference so keep it up! I loved what Timothy Gregoire did – he made a bookmark called Amazon and made it a link to podfeet.com so he’d remember to use my search window for Amazon thus funneling a small percentage of every purchase to help the show. I think we shall declare that a best practice! If you’ve been following Don McAllister on Twitter then you have heard him teasing the Internets about his new super secret project. 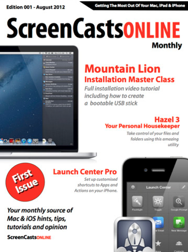 Late this week all was revealed – he’s created a digital magazine called ScreenCastsOnline Monthly Mag for the iPad. It’s really really cool. It will contain his world famous video tutorials, AND articles written by many good friends of the show – the lovely Katie Floyd, talented videographer Wally Cherwinsky, the ever self-deprecating David Sparks, the mastermind of freeware and menu bar apps Tim Verpoorten, the most beautifully voiced Jane from Perth, and ME! For the few people out there who haven’t seen Don’s work, it is absolutely the best possible way to learn how to use tools on the Mac. I learn something EVERY time I watch one of his tutorials, even on applications I have been using for years he finds things I never noticed. He’s also got this delightful Liverpudlian accent that I adore. Don put out a video explaining how it works, so I put a link in the shownotes to the video. If you’re not already a member of Screencasts Online, this is a great way to get your feet wet finding out what Don can bring to you. The first issue that’s out right now is free to get you hooked, and you WILL get hooked, but the follow on issues will be $4.99 for one month or $48.99 for an annual subscription. If you become a ScreenCastsOnline member like me, you’ll get the monthly mag for free! I’m super excited that Don let me be a part of this project, and the slave driver has actually already made us write our articles for the next issue! Go check it out in the iTunes Store, search on ScreenCastsOnline Monthly Mag or follow the link in the shownotes to get right to it. There’s pretty much ONLY one thing I like better about Windows 7 than OSX. Let’s start with the problem to be solved first. You’re watching a Youtube video and it’s kind of quiet so you crank up the volume. while you’re enjoying the cat playing the piano, someone chats you and it blows your eardrums out. On Windows you can change the volume of different applications, so I always keep chat down low – loud enough that I’ll notice it but not so loud it knocks me out of my chair when I get an incoming chat. OSX doesn’t have anything like this. Research Assistant Niraj sent me a link to a third party application for OSX that may solve this problem for us. It’s called SoundBunny from prosofteng.com. Now I was a little worried that an application that can control sounds beyond what Apple intended might be a kernel extension, but I copied the application to my disk and then looked at the package contents and it didn’t have anything with a .kext extension so I think this one is ok. SoundBunny says you have to restart your computer so that it can “load core system processes appropriately”. As instructed I restarted and when SoundBunny launched it showed me a list of all the applications I had running, each with it’s own independent volume slider. You know I love TextExpander, but I’m afraid my darling husband Steve doesn’t like the cute little beeps and boops it makes every time it expands a snippet for me. I like it but I guess for me it is the sound of efficiency, but for Steve it’s just annoying. I figured that’s the first sound I should turn down when I started playing with SoundBunny. It showed me both TextExpander and TextExpander Helper in the list of applications, but oddly dragging both their sliders down to zero and even tapping the mute button didn’t change the volume of the TextExpander sounds. Hmmm. Right while I was playing with that (with my volume cranked to max, I got a tweet from Jonathan Cost and it was REALLY loud! Ok, over to SoundBunny to turn down Yorufukurou’s slider. I purposely engaged in some more conversation hoping he’d write again, and sure enough when he replied my twitter client was a pleasant low volume alert. Great! I mentioned that SoundBunny gives you a list of running applications, but it’s a GIANT list, showing you things that never make noise, like Stickies, VMware Fusion, and Alfred. It makes it a little bit harder to fish through and find the things that actually make noise. Next test – I used Chrome to go to Youtube, again with the regular volume cranked to the max. In SoundBunny I muted each of the Chrome-related items one by one, Chrome Helper, Chrome Renderer, Chrome Worker and simply Chrome. With all four of them muted in SoundBunny, the video still played at full volume in Chrome. Failure on two out of three of the applications I tried was disappointing to say the least. I tried to contact the SoundBunny folks about the problems I was finding and they never got back to me. This was a cool idea and I sure was excited to get some functionality that I really like in Windows 7; It even has a really cute bunny icon, but I sure can’t recommend the $10 SoundBunny application. Last weekend on the Mac Roundtable I mentioned that Steve discovered something pretty important to him had been removed from Safari 6 that came with Mountain Lion (and which showed up under Lion with the security updates). He does freelance work where he needs to download (legally) videos that have been created for his clients. In the past there was a little trick in Safari where you could simply watch the Activity Window for the biggest sized file as you’re watching the video, then right click on it when it’s done playing and download right from there. With that gone, he went looking for a plugin for Safari and/or Firefox. Rick Abraham on Twitter and I both found the same tool that might be an ever better solution – a dedicated client just for downloading Youtube videos. 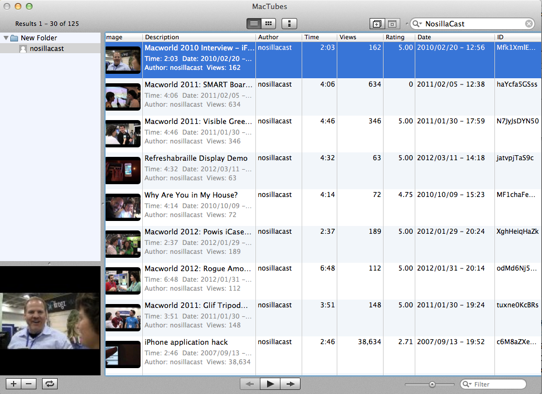 It’s called MacTubes from macapps.sakura.ne.jp. This is a Japanese site but there’s a link in the upper right to change the language to English if you prefer. There’s a search bar in MacTubes just begging you to search YouTube, so of course I typed in NosillaCast to check out my own videos. I was instantly rewarded with a the latest 30 videos we’ve uploaded. (you can change that value in the preferences). MacTubes shows me a thumbnail of the video, the length, number of views, and upload date. From right in that window you can play the video in an embedded player that gives you all of the typical video controls, closed captions, quality changes, full screen, and volume controls. There’s a gear controller that allows you to do a few things, one of which is to actually download the video. 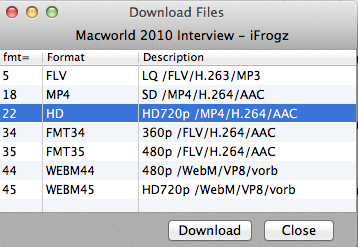 But before you barrel through to that, you can actually see all of the different file options available to you. I was amazed at all the options – one of our videos I checked out had three sizes of FLV flash videos – low quality, 360p and 480p, and also an SD mp4, a 720p HD mp4, plus two sizes of WebM video files for 480p and 720p. I had never heard of WebM but if that’s what you want – there you go. I can prove that MacTubes is worth the full price of zero dollars – I lost 45 minutes on Wednesday night because I started watching renditions by fans of Beyoncé’s Put a Ring On it! So check out MacTubes from macapps.sakura.ne.jp at your own risk – even if you just use it as a search tool and player you’ll love it! On the Mac Roundtable last week I mentioned Steve’s woes that the Activity trick to download Youtube videos is gone in Safari 6, and I got a tweet back from Donald Burr (aka @dburr on Twitter) telling me that you CAN download videos from YouTube using Safari. Now if you were Donald and you wanted to show me how to download videos using Safari, what tool would you reach for to teach me? Well of course Donald fired up what he calls “a certain podcaster’s favorite tool” – he grabbed Clarify from BlueMangoLearning.com and whipped out a tutorial for me. He took screenshots of how to download and install the YouTube5 extension for Safari, he annotated the screenshots to highlight what to click on and even encircled the button to donate to the developer of YouTube5. He added some text to the screenshots explaining why to do each step and then all he had to do was click the Share button and it was uploaded to his clarify-it account at dburr.clarify-it.com. That’s much cooler than just having a PDF to mail around, he can send people the url, and if he made a mistake or wanted to update it later he can without having to resend out the document. Clarify is only $29.99 in the Mac App Store. If you like helping people you’ll love Clarify from Bluemango Learning! So I’ve never been the type to steal music, steal movies, I don’t bittorrent except for Linux distributions. But I along with many others are pretty frustrated with NBC’s coverage of the olympics. I work all day so I can’t be fooling around watching the iPad app during the day to catch the sports I want. For some reason I thought maybe the NBC news would actually cover the days events so I could see the cool stuff that happened, but no, not so much. At 7 they have Olympics on one of those really annoying entertainment shows which is worse than not seeing it at all, seems it’s been all about Justin Beiber and the swimmer Missy Franklin (not about her swimming at all). During lunch I’ve seen a bit of actual athletes doing stuff, but it hasn’t been the sports in which I have high interest. So I wait till 8pm which is pretty late to see the actual athletics, and I’ve seen some cool stuff but still not what I wanted. TunnelBear creates a secure, encrypted connection between your computer, tablet or smartphone and a server in the host country you want to connect to. If your communications are intercepted before they reach the TunnelBear servers, they’ll just look like unreadable jargon. To the internet it will look like your signal originated in the host server country. So clearly this is getting around the express desires of NBC, but it doesn’t sound illegal to me. Now on the other end it’s a bit dicier. The folks in the UK pay television service fees and that pays for BBC, and I’m clearly not paying for it so…I decided that since the British are going to get to see the 7 minutes of terror when NASA lands a rover on Mars, and I helped pay for THAT, the British probably wouldn’t mind if I tunneled over for a peak at our own gymnast winning the Gold. I promise not to use it often, just when I REALLY want it. So I downloaded TunnelBear – they have three tiers of pricing. A Little TunnelBear is free for 500MB a month (the occasional tunneler), A giant-sized bear for giant-sized (unlimited) tunnelling! Having a Giant Tunnelbear also adds extra “bear-grade” 256-bit data encryption, and the legendary Grizzly TunnelBear. He’s exactly like his Giant brother, but lasts an entire year and saves you a whopping 17% in bear food (cash). I went for a free account, it asked for an email and password, and then sent me a confirmation email. TunnelBear’s window has an old-style radio look to it – weathered woodgrain with two dials. On the left there’s an on/off switch and on the right the dial says US and UK. I started up a browser and went to http://www.bbc.co.uk/iplayer/tv/bbc_one_london/watchlive before turning on TunnelBear and saw a notice saying, “Currently BBC iPlayer TV programmes are available to play in the UK only, but all BBC iPlayer Radio programmes are available to you.” That’s nice, but I want TV. I turned TunnelBear on, set the second switch to on and refreshed my browser. Immediately I was treated with access to all the content. I clicked on the Sport tab, found gymnastics, and then found the video of Gabby Douglass winning the gold. so cool. then I politely shut it off and went back to watching NBC. Thank you TunnelBear and thank you BBC. I promise to be good and not abuse this! After I got all done with watching the Olympics I wanted to watch, I got a dire warning from Google telling me that someone had tried to use an application to sign into my Google Account and that they were on the watch and prevented it. Turns out I’d had Gmail open while I was running TunnelBear so it looked like I was coming from a UK IP address and clearly that must not have been me! I like that Google’s on top of this but it freaked me out at first! Since this security light was recorded on 29 July more stuff may have happened since! Password breaches continue to happen – no point trying to list all the sites because there are just too many. The point is this epidemic of password leakage is continuing apace. For people upgrading to Mountain Lion, now might be a good time to check-over your OS X security settings. Check that your Firewall is on – if you have a laptop this is VITAL, but even if you don’t, host-based firewalls can help slow down malware bouncing around in your LAN. Ensure you have GateKeeper set either at it’s default level, or on ‘App Store Only’, allowing all apps to run is needlessly dangerous. You can make case-by-case exceptions if you need to. If you have auto-login enabled, seriously consider disabling it – you are just making it too easy for any random person to get at your stuff. Even if you trust all your friends and family, all your kids, and all your kids friends, what happens if the machine gets stolen? Bad enough all your files will be available, but at least if your logged out your passwords in your keychain are safe! Seriously consider setting a screensaver/wake from sleep password – again, see above – you want your keychain locked when you are not at your machine. If you’re not running AV – consider running at least a free one like ClamXav on at least your Downloads folder. If you’re not running TimeMachine – consider it – it’s not hard, and it could really save your bacon. Even if you already do a clone backup (e.g. Superduper or Carbon Copy Cloner), a versioned backup is complimentary, not redundant. FileVault2 makes it very easy to encrypt your entire main hard drive – just turn it on in SystemPreferences→Security→FileVault – DO NOT LOSE THE RECOVERY KEY!!! If you have sensitive data on external disks – consider re-formatting them with encryption. I mentioned last time that I have an automator action set up that interacts with my XKpasswd.pm Perl library, and people were curious about that. I didn’t want to answer right away because the code was badly in need of some tidying up. I spent the weekend doing that, so v0.2 of the code was released today. I’ll be posting blog posts with sample Automator Actions between when we record this, and when it goes out a week from now. Since we recorded, Bart sent me a note today (Saturday) that he did write up the Automator Actions he promised and put them in a blog post on bartb.ie. I put a direct link in the shownotes to Bart’s post about how to create Automator Actions for XKpasswd: http://www.bartbusschots.ie/blog/?p=2357. I turned on FileVault this evening and got rather a shock when my system rebooted as my screen gained a VERY pronounced blue colour cast. I believe FileVault is the cause, based on Bart’s description of the altered boot sequence. Interesting discovery in an Apple support article about FileVault. To ensure security when you turn on FileVault, other security features are also turned on. For example, a password is required to log in, after waking from sleep, and after leaving the screen saver. So apparently no need to turn those on separately. 2) Let Disk Utility run a full a disk First Aid check of the entire drive (not just your boot partition) to make sure there isn’t something wrong with the Recovery Partiton (necessary for FileVault2 to work). I don’t mean to imply that I know what caused the problem described above. I’m just sharing a safety tip I’ve been using with my/my family’s machines — and with success. I get a bit irritated when I can’t watch a 60-second clip someone has posted from Colbert/Stewart because I have a UK IP address, but not quite irritated enough to start faffing about with proxies. So TunnelBear could come in pretty handy. The 500 MB/month on the free account ought to be enough for occasional use. You can get another 1 GB by sending a promotional tweet (and – pssst – there’s nothing to stop you using a secondary Twitter account to avoid spamming your friends). One thing maybe worth mentioning: installing the app required me to install Java (which is uninstalled when you upgrade to Mountain Lion). This might give some people paws – sorry, pause – for thought.